Look!! I am early for another holiday, it is a Autumnal miracle : ) I am so excited to be linking up with a great group of teacher/blogger/creators for a fun Halloween blog hop. 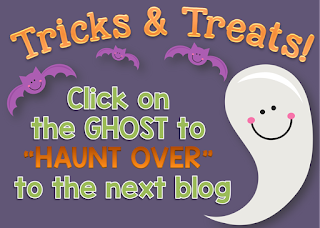 Hop along to all the blogs to pick up some great Halloween tips and freebies.....and then enter for a chance to win a fabulous prize. "What?" 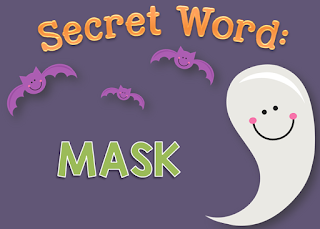 you may be saying to yourself and "this is a Halloween blog hop!!! "...yes I know that, BUT some years we have a class with a student that makes it hard or impossible to do a full on Halloween theme. So my first tip is to be prepared with books that are fun and fit the season but are not full blown Halloween books. It is a fun book to make predictions, discuss mood (all the pictures are black, white, grey and orange and eerie), message of the story or big idea, story elements and so on. It is just a good all around book for shared reading. 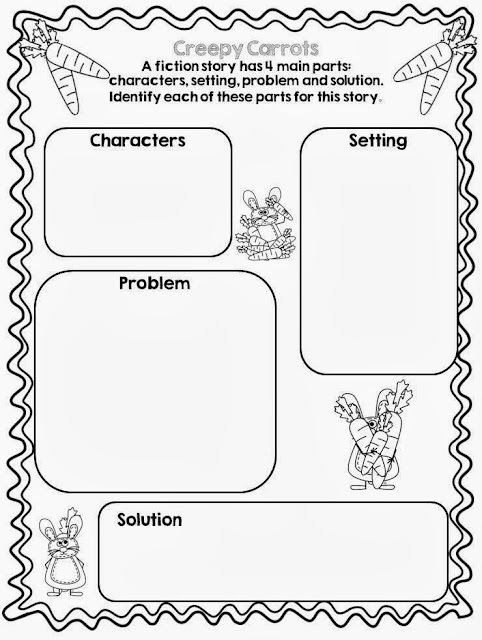 Here are the follow up sheets we did in our class if you are interested in trying this book out. Click on the picture to pick up a free copy (pics are linked to opposite pages, sorry). Here is a great video that you can use to show the illustration process. 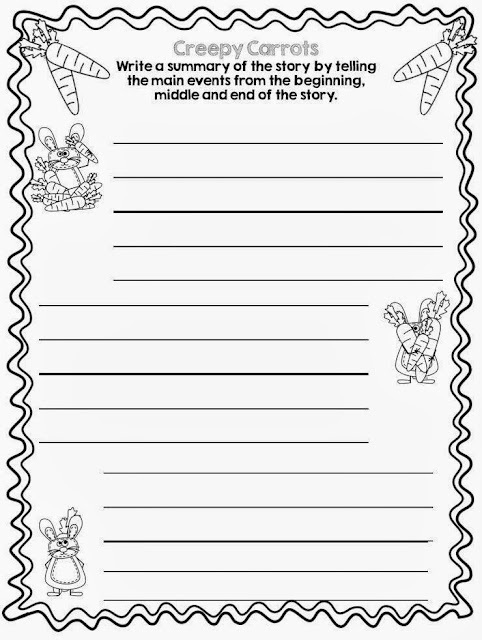 Polka Dot Kinders had her students write how they would deal with creepy carrots and made their own creepy carrots. First up....eyeball ping pong balls. I put numbers on them, place them around the room. Students grab two eyes and add them up (or multiply if need be). We have also done an activity where they get one eyeball and record it, then write the number that comes before or after the number. You could write larger numbers on your eyeballs and make it a 10 less, 10 more activity. I have also had them pick one eyeball and create a number bond. Simple, fun and gets them working on skills without even knowing that they are working. They love eyeball math!! Click here for a copy of an eyeball math recording sheet. This year our focus is spiders (non-fiction and science learning). So I have this great collection of bugs. We will be using them to write addition and subtraction sentences. I also have a collection of Halloween erasers, perfect for continued patterning practice (as an early finisher activity or as a center on Halloween). I also have finger pointers, a Halloween must have. Lastly dollar stores have so many great Halloween containers to hold all these great goodies. That's right 4 gift cards!! Perfect to purchase some Halloween themed activities or get a jump start on Christmas planning! Thank you so much for these excellent freebies and story suggestions! I am going to find these books right away! Wonderful and informative post! What fun freebies!! I LOVE Creepy Carrots and will definitely be able to use your pages! Thanks so much! Loved reading this blogpost so much I'm going to bookmark it on Pinterest! Thanks so much for sharing your fantastic ideas! I love all of your great fall/Halloween ideas! 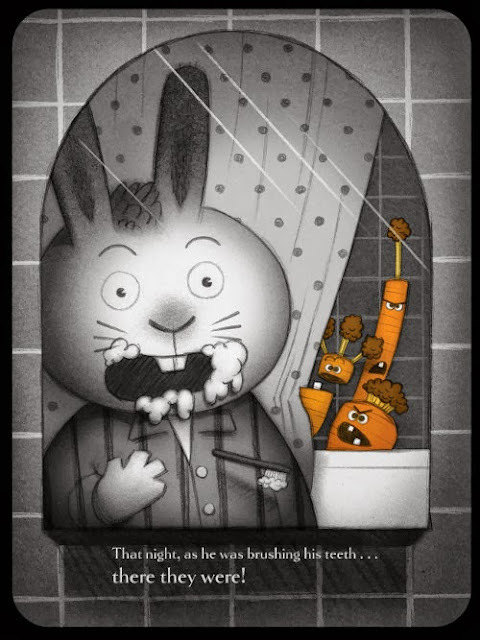 :) I actually have never read Creepy Carrots, but it looks so cute! I'm gonna have to pick it up! And I love your eyeball number ideas- those are awesome for math and the kids will be so engaged and excited! So fun!!! 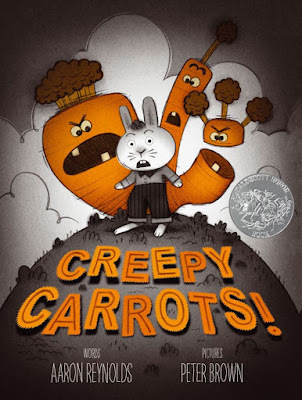 Creepy Carrots looks fantastic! How did I not know about this book?! A couple of my friends have a student or two who does not celebrate Hallowe'en, so their classes can't do it. But they could read this! Thanks! I have been wanting to read this book! I have the perfect incentive now thanks to your activities. Thank you! Loved reading your post. I will need to search for that book in my library, asap! Thanks so much for the freebie! Love all these ideas, but my favourite are those ghoulish eyeballs :) I know a few kids that will go crazy once they see those, lol. Thank you for the wonderful freebies, book suggestions and classroom ideas.